If you’ve read my post about the history of the wedding cake, you’ll know that wedding cake toppers aren’t that traditional. In fact, they weren’t commonly used until after Queen Victoria married Prince Albert in 1864. From there, wedding cakes became extravagant and were a thing of beauty; not just to eat! Wedding cake toppers are now a must have for brides and grooms. There are so many different styles though, people no longer want to opt for the traditional man and wife topper. Here are some great ideas for wedding cake toppers without spending an absolute fortune! Our first topper smashed but luckily my sister and her boyfriend had bought us a set of crystal ones. They’re beautiful, small and just us so we ended up using them (although they weren’t originally bought to be used on the day!). Glass and crystal toppers are great because they can catch the light in ways that others can’t. They’re great when the cake is in the middle of the dance floor while you cut it or for guests to see as they go past. They’re also excellent keepsakes for the wedding and perfect for having out on show. The downside to them is that they can be small. Since our crystal cake toppers were never meant for the day, our cake decorations were too big for the toppers. They looked tiny on our top tier and I don’t think everyone saw them. However, there are different sizes available to suit your needs on the day. If you love to have a laugh and it is all part of your personality, show that with your cake toppers. There are many designs available, such as a bride pulling the groom by the leg or the man and wife locked together with handcuffs. These will make great talking points for your wedding and you’ll soon have your guests asking where you got them from – and whether it’s a true depiction of your future marriage. For those wanting something a little different, there are animal cake toppers available to add some fun and humour to the day. You could even taken playing pieces from your favourite game, if you’re known for that, to add your personality. Watch out with the fun and jokey ones though as you could do too much with them. It can be easy for the big day to be ruined all because of the way the cake toppers are viewed. You’ve also got to consider the guests, especially if you have ones who don’t approve of the marriage. 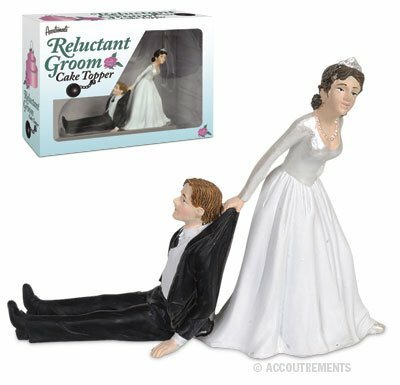 Make your guests laugh with this funny wedding cake topper from Accoutrements. Made from polystone. Before we ended up with the crystal wedding cake toppers, we had a beautiful, porcelain heart centerpiece for the cake. We didn’t want to do the same as everyone else and decided that was a great way to keep that going. Unfortunately it smashed an hour before the cake cutting and a friend is still trying to repair it. The best thing about a beautiful centerpiece is that you could get a centerpiece for the top table to match it. This works if you have a top table of course! We got one that was made out of the same material and had a couple kissing, with their arms making the shape of a heart. We still have that and it’s on a dining room shelf waiting for its cake topper counterpart. The downside is these types of cake toppers can be heavy. We had a chocolate orange top tier and had to make sure that it would be stable enough to hold the weight. Originally we were going to have a fruit cake top tier, which would have definitely held it. The wedding is all about you and you can add that to your wedding cake topper. One way of doing that is adding something from your childhood, your nationality or just your personality – something that means something to you both. This is especially great if you have a wedding joining two cultures. This doesn’t have to be flags – although was something my sister suggested for us. We used white roses while decorating the cake in tartan to show the joining of my husband’s clan to my Yorkshire roots. We could have done something similar for the topper but decided against it but that doesn’t stop you! If you’ve known each other all your life, use something that represents who you are as a couple. It shows how the two of you have come together and will mean much more than a set of bride and groom figurines. So, there you have it, four fun ideas for wedding cake toppers. Think about doing something fun, different and personal for your big day. You don’t have to go for traditional – after all, the plastic bride and groom toppers have only been around for a few decades. Did you have something different for your big day? Are you currently planning your wedding and looking for ideas? Feel free to share your thoughts and own ideas into the mix.